The difference between Cacao and Cocoa. 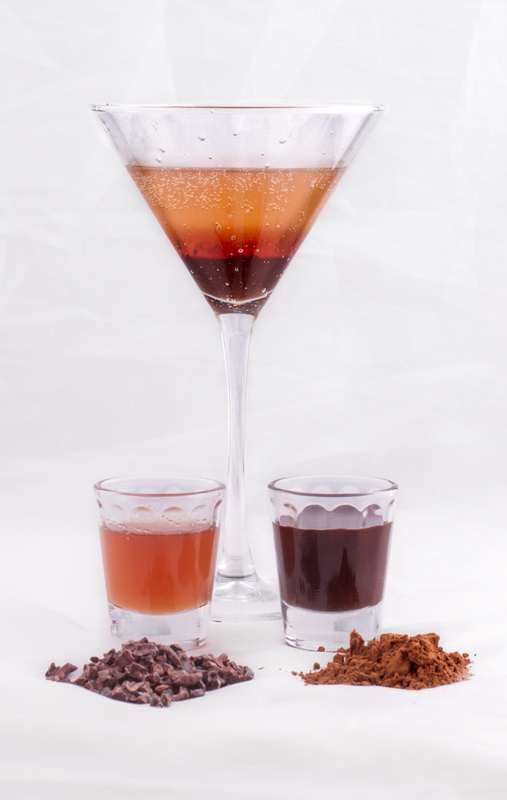 From left to right: Cacao Nibs, Cacao Nib Syrup, Chocolate Mocktini, Chocolate Syrup and Cocoa Powder. Did you know that cacao nibs are the raw form of chocolate? Did you know that they are said to have one of the best sources of magnesium. According to WebMD “Researchers estimate that the average person’s body contains about 25 grams of magnesium, and about half of that is in the bones. Magnesium is important in more than 300 chemical reactions that keep the body working properly.” National Institutes of Health lists some of these chemical reactions “including protein synthesis, muscle and nerve function, blood glucose control, and blood pressure regulation” And that is just five! If your into nutrition and science then check out the links to find more. Ok, but back to food right? What the heck is Cacao? and why are they spelled different? Is that just a Canadian thing, eh? Nope. Nothin’ like that. Turns out that Cacao is unprocessed and the real raw deal. Cocoa processed and can refer to products with added sugar. But not always. I checked this out by reading the ingredients on the back of my Fry’s Cocoa Powder. Processed – yes. Sugar added – nope. Here is the ingredients on my container: Cocoa, sodium carbonate. May contain peanuts, tree nuts, milk, eggs, wheat and/or sulphites. So the last bit is all about the “don’t sue us if you have an allergic reaction, we processed this somewhere where other stuff you may be allergic to is held and/or processed.” But the first bit? So Cocoa and … what? Sodium Carbonate. An additive used to keep the powder from caking, grumping up, compacting like a lump. Get the picture? So processed, but pretty pure, well mostly. Ah sorry, again with the science right? Jeez. This blog is called Experimental Virgins for a reason. Love me some science. Back to drinks though. Why do I care? Why bother with all this research? I want to make drinks as close to the original tastes of the adult versions as possible, when possible. Infusing Cacao Nibs will give a clear fluid, while using Cocoa Powder will give an opaque look. Think of it as the difference between cinnamon sticks and powder, there is a place for both. You don’t put whole cinnamon sticks into cinnamon buns (mmm cinnamon buns…) and you don’t put ground cinnamon into a clear iced tea. Same thing with Cacao Nibs and Cocoa Powder. On to the recipes and enough with the preamble. I came across cocoa nibs in my research to find a way to make an alternative to creme de cacao and looked up as my starting point DIY Chocolate Liqueur. The basic ingredients for flavouring? Cacao nibs. Infused in vodka along with sugar, water and vanilla. Combine all ingredients in a small saucepan and bring to a boil stirring to dissolve sugar. Simmer 5 minutes, then remove from heat and allow to cool completely. Strain the syrup through a fine sieve; discarding the solids. Store in fridge until needed. First thing you should know is 1 made six, yes six, times the recipe. Go big or go home I say, and I am gonna use this a lot! Gotta have stuff to test with, and gotta have enough to make mistakes and go “ick” and chuck the drink in question down the sink. After the said time I strained the syrup, keeping the nibs for the time and tasted the syrup. Then in an exercise of science, I divided the syrup in half (remember I made six times the recipe) and added the nibs back to half the syrup. According to the DYI for chocolate liqueur, it calls for 8 days to steep the cacao nibs in the vodka before adding the remaining ingredients, then one more day to blend flavours. Since sugar syrup is thicker than alcohol I gave it two weeks in the fridge. How did the original syrup taste? Chocolatish. Ok so that’s not a word, but cacao nibs don’t taste like a chocolate bar. Remember not processed and unsweetened? They also have a nutty taste and are a bit acidic. The husband says it tastes a bit like maple syrup with a dash of apple cider vinegar. Final thoughts? The quality of the nibs makes a difference, and infusing the nibs for 2 weeks with high quality nibs will give you the best product. What name brand did I finally choose? Navitas Naturals Raw Organic Cacao Nibs (unsweetened). If you can’t find them locally, I got mine from HealthyPlanetCanada.com. Sometimes you need a real thick chocolate syrup for the job. Our family tested out a few we found on the net with the “chocolate milk” test. Does the syrup make a good cup of chocolate milk? Is it chocolaty enough, too bitter, too sweet? The first from Allrecipes.com was too weak in our minds, especially when mixed with milk. The second passed the muster. This one is from KitchenTreaty.com and is thick and strong, but makes a great chocolate milk. You can find all the instructions on their site here, but to get you started here is the basic list of ingredients you will need. To show the difference in density and opaqueness of the two syrups I decided to make up a simple martini using both drinks, layered and topped with soda water. I probably wouldn’t serve this, as is, since the Cacao Syrup doesn’t work alone with soda water. Once it’s mixed it is reminiscent of a rich cold cocoa drink. – more appealing, but again, not quite there yet. My husband added a splash of cream and it became “OK”. It is pretty though, and if one were to mix something else with each layer, and serve with cream on top, or maybe a candy cane for stirring, this could have potential. I think I will revisit this around Christmas time, maybe add some mint and see if I can’t come up with something inspirational. Posted on November 6, 2014 November 4, 2014 by orionssong	This entry was posted in coffees, lattes, chocolates and teas, Syrups and Infusions, Virgin martinis and tagged Cacao, caramel, chocolate, Cocoa, Cocoa Powder, health benefits. Bookmark the permalink. Loved the preamble and the science info.